Present Status : Unit replaced with a Praetorian, Mark 2 tech enhanced Warrior Class type 2, unit and remains a sworn ally of the Warrior Guyver. 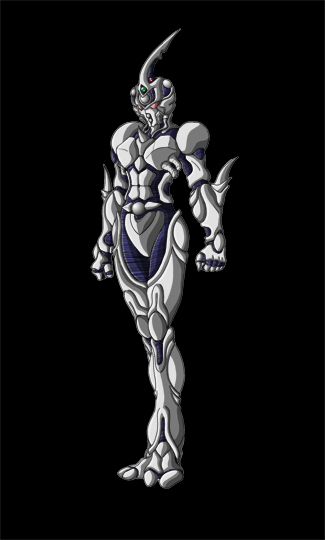 Description: A time displaced Guyver from the legendary age of the Creator/Guyver Zoalord war, that took place over two and a half million years ago, was brought to the present by the Warrior Guyver and joined forces with him in his continuing battle against Chronos, until nearly destroyed in a battle with Chronos. The subject has since had her unit replaced with a special Mark 2 enhanced Warrior type 2 unit and has now become one of our most powerful warriors against Chronos. Special Note: Jason O’Conner has gone rogue, details of incident are classified, and is no longer an agent of Chronos. However, he is still a declared enemy of Chronos and may still assist ACTF forces when our goals are the same. ACTF agents have thus been informed to use their best judgment on whether he can be trusted, on a per mission bases, or whether he could pose a threat and take the appropriate action to ensure mission security, if possible. ACTF Agents have also been advised to take into account the extremely high power level of Jason O’Conner’s Dreadnought form during any and all encounters with him. Since subject is his sworn ally, she is to be treated in the same manner until further notice. -Physical Strength: Subject’s abilties varies due to this unit’s unique technology. The Unit’s CPM’s have been integrated into the unit’s HSL power system and allows subject to raise power level from 6 times a standard Guyver, to 10 times, at will. Consequently, this eliminates the use of the CPM’s as a weapon, but grants subject the strength of 600 to 1,000 men. 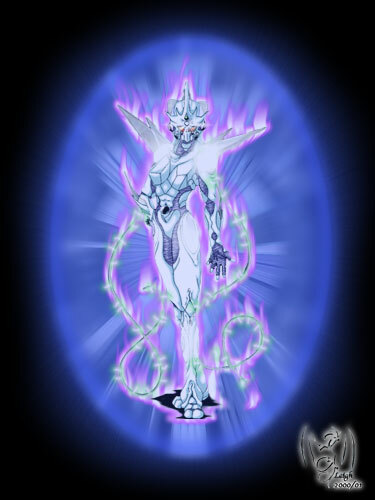 This can be temporarily boosted to 20 times a normal Guyver with the use of the Bio-Energy doubler. Though equiped with a HSL power system, use of the Bio-Energy Doubler for more than a few minutes results in a massive drop in power level to that of a normal Guyver. Depending on regeneration requirements, the power down state can last as long as an hour before subject regains normal power levels. -Durability: Subject is greatly enhanced from a standard Guyver. 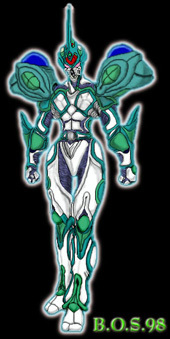 In addition to the normal Warrior Guyver type body shield, the armor’s molecular structure is enhanced with a powerful bio-energy field that greatly enhances all aspects of the base armor dexterity. Letting the subject withstand anything up to a 0.6 to 1 kiloton explosion without any additional shielding. The addition of the subject’s Gigantic type omni-directional shielding, reinforced with subject’s bio-energy, zoalord like gravity shield and Guyver blast shield, allows subject to withstand a 3 to 5 kiloton explosion, depending on subject’s power level. Regeneration rate is 40 to 100 times that of a normal Guyver. Use of the Bio-Energy Doubler can temperarily double subject’s durability levels. -Speed: Ground Speed = 0-1,250 MPH at normal base power level, up to 1,875 MPH at normal max power level, and up to 3,600 MPH at full Bio-Energy Doubler enhanced level. Flight Speed = 0-4,500 MPH at normal base power level, up to 7,500 MPH at normal max power level and up to 15,000 MPH at full Bio-Energy Doubler enhanced level. Reflex speed ranges from a norm of 40-400 times normal to a Bio-Energy Doubler max. of 800 times normal. -Sonic Busters: The unit’s sonic weapon emitters have greater versatility and power over standard Guyver type. Radius of attack can range from 15 to 160 degrees and intensity can range from a low hum to 10 times that of a normal Guyvers. Allowing subject to kill any unprepared zoanoid up to hyper class. Subject can also enhance this weapon with a bio-energy field that allows secondary electrical damage upon target and the ability to redirect sonic attack, around target, for an implosive repetitive shock wave effect that focuses the total power of the attack upon a single target for maximum effectiveness. -Infrared Laser Orb: Head beam emitter generates a highly efficient infrared laser beam that is 30 to 50 times more powerful than a normal Guyvers. Use of the Bio-Energy Doubler doubles the energy output to 100 times the power of a normal Guyvers head beam. -Hyper Sensors: Subject has a sensory range of 5 to 8 kilometers (~3 to 5 Miles). Complete with a full enhancement of all the host sensory perceptions to a few hundred times that normal for a human. -Vibrational Swords: The unit possesses a single pair of vibrational swords that are composed of polymorphic material that allow it to morph into a variety of shapes and sizes at the users will. Though basically similar to the Warrior Guyver type, these swords have been further enhanced by the Mark 2 technology that allows the subject to infuse the swords with plasma energy when powered up to normal maximum power level. This more than doubles the destructive power of these weapons and allows them to cut through any unenhanced vibrational weapon. These weapons can also be extended like the Gigantic type for whip like use upon targets not within normal arms reach. -Mega Smashers: These weapons are similar to standard Warrior type but have a destructive power output of 3 to 5 kiloton explosion of TNT and when used with the Bio-Energy Doubler, these weapons can fire a blast with the destructive power of a 10 kiloton explosion for a full ten seconds, but doing so greatly reduces the time the subject can use the Bio-Energy Doubler. -Gravity Control Orb: Gravitational Powers are equivalent to subject’s power level and includes both standard Guyver abilities as well as those common to Zoalords, such as gravity bullet and black hole attacks. The subject can also focus gravitational power upon a single target to produce an implosive pressure cannon effect with the destructive power of a normal Guyver’s Mega Smasher. Subject also has the ability to generate the Gravity Crusher, a gravity weapon previously unique to the Jy-taki of the W’Kar parallel world. By creating an immense Gravitational rift around a target, the Gravity Crusher can shrink the target to 1/8 of its normal size. The Gravity Rift is then suddenly released and the target snaps back to their normal size in 4/100 of a second. The body does not have time to compensate, and the effect is a deadly combo implosion and explosion. The weapon has shown to be deadly to any and all unshielded targets and even those with shields have been effected in drastic ways. Control Medals and Zoacrystals can be shattered with incredible ease with this weapon, along with massive damage to the target(s) body. The only inhibiting factor is the need for the subject to be in full Bio-Energy Doubler enhanced power level before this weapon can be utiltized. -Bio-Whips: The Mark 2 technology has caused a special mutation in this unit, producing a pair of extendible tendril like bio-armor whips that extend from the head and have a reach of 10 to 30 feet. Subject can also channel the total power of her bio-energy to a target. This is very similar to the hyper zoanoid Elegan type primary attack but subject can channel up to twenty times more power. The whips can also be wrapped around a target to crush it just like a constricting snake, with each tendril excerting the equivalent strength of up to 200 men each. -Additional information: Though subject is from a pre historical time period, her cambat ability should not be underestimated. Subject was raised in the era of the Creators time on Earth and hence is a trained warrior who will not hesitate to kill her enemies with extreme prejudice. -Below is the images of the subjects previous armored form, Aceaer enhanced form, and the human Aceaer form right after losing her original unit and before acquiring her unit.